The STS-118 crew, including Barbara Morgan, narrates its mission highlights film and answers questions in this post-flight presentation. Space shuttle Discovery rolls out of the Vehicle Assembly Building and travels to launch pad 39A for its STS-120 mission. NASA's Dawn space probe launches aboard a Delta 2-Heavy rocket from Cape Canaveral to explore two worlds in the asteroid belt. These briefings preview the launch and science objectives of NASA's Dawn asteroid orbiter. Estimates of the age of some millisecond pulsars are out by a factor of ten, according to new research presented at the 214th American Astronomical Society meeting in Pasadena, California, this week. This realisation will help in efforts to understand how these whirling dervishes evolve. Just last month it was reported that a millisecond pulsar had been observed being spun up like a spinning top in real time (read our story here) by accretion of gas from a companion star in what’s known as a low-mass X-ray binary system. The process accelerates the rotation of a pulsar – the remnant of a supernova – up to several hundred, or even over a thousand, times per second. This was the first time we had ever seen a millisecond pulsar being created. How old are millisecond pulsars? Image: NASA. However, for many millisecond pulsars, we have no idea when they were created, or indeed how old they really are. There are several independent means by which a pulsar can be dated, such as the presence of a dusty remnant from the supernova that gave birth to it, or a white dwarf companion for which the age can be derived from models of the cooling of white dwarf atmospheres. Without these, it is impossible to know how long a pulsar has existed before being spun up into a millisecond pulsar. That said, work done by Bülent Kiziltan and Stephen Thorsett from the University of California, Santa Cruz, shows that we can accurately measure how long a pulsar has been a millisecond pulsar by using more detailed models of the maximum rotation a millisecond pulsar can achieve, and the ‘spin down’ time (how long it takes for a millisecond pulsar to slow down). “We modified the age calculations to be consistent with these constraints and showed that this approach can achieve estimates closer to the true age of the pulsar,” says Kiziltan. Their findings suggest that some millisecond pulsars are several billion years older than we had estimated, while others can appear ancient but are instead quite young. “When we refer to the ‘true age’ of a pulsar we refer to the clock that starts ticking after the onset of radio emission as a millisecond pulsar,” Kiziltan told Astronomy Now. We know that stars that create pulsars in the first place only exist for a few million years before exploding, but we can only guess how long ordinary pulsars last for in low-mass X-ray binary systems before being spun up. Adding extra complication to the matter is Kiziltan and Thorsett’s suggestion that there is an alternative, unknown method by which a millisecond pulsar can form. A proportion of millisecond pulsars have very powerful magnetic fields that, they say, could not have arisen from accretion from a companion star (you can read their paper on the Astro-ph website: http://arxiv.org/abs/0902.0604). 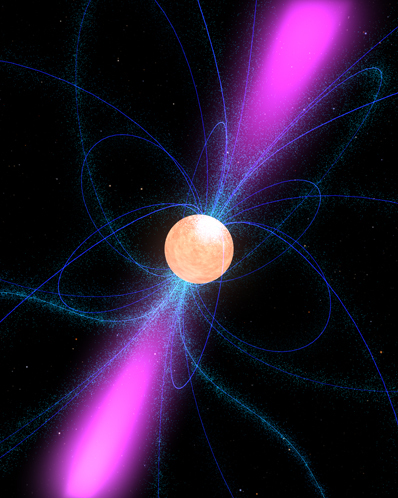 “You have to consider that the origin of millisecond pulsars, or at least a fraction of them, is still under debate, which argues that at least for some of the millisecond pulsars the standard evolutionary scenario does not work,” says Kiziltan. It seems we still have much to learn about these incredible, dizzying objects.